Is cookie butter your favorite snack to eat off a spoon too? 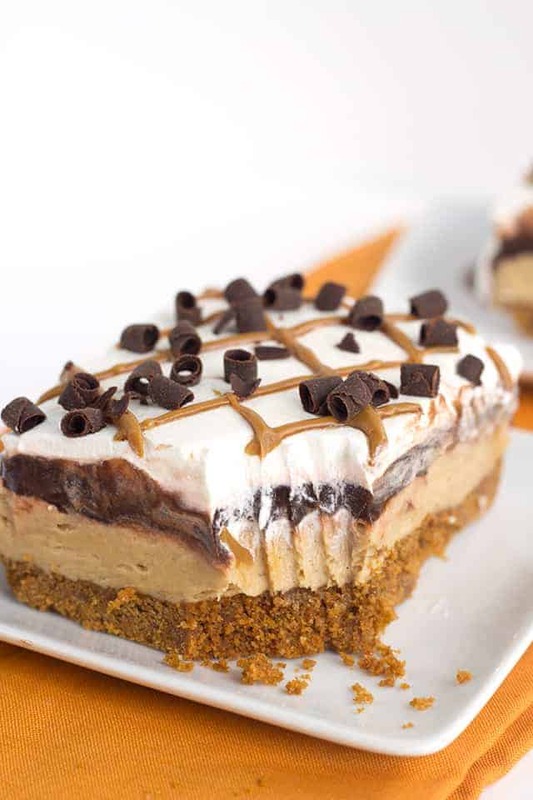 Then you need this cookie butter layer dessert too. 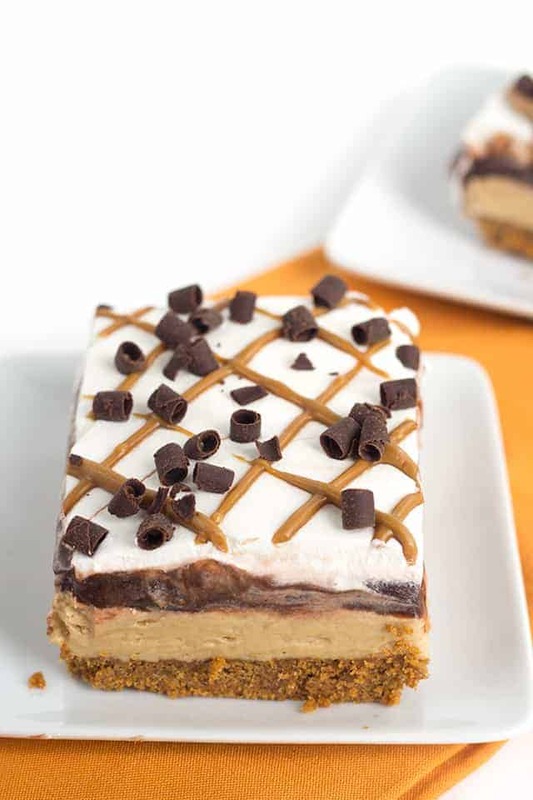 There’s a speculoos cookie crust, a cookie butter cheesecake mousse layer, chocolate pudding, and whipped cream in this recipe. Does it get any better? If you’re more of a peanut butter lover, click over to my chocolate peanut butter layer dessert. It’s similar to a nut butter but it’s made of cookies! No, it’s not good for you, so don’t look at the nutritional facts. It does come in creamy or crunchy. What is in cookie butter? Trader Joe’s cookie butter, which is the only kind of cookie butter that I will acknowledge, has speculoos cookies in it. I bet you’re thinking that I need to speak in layman’s terms huh. It’s similar to a gingerbread cookie with cinnamon, nutmeg, cloves, ginger, and lots of butter in them. Now that we’ve gotten the basics out of the way, let’s just sit and admire this cookie butter recipe. The drizzle on top and the chocolate curls give this the perfect presentation. 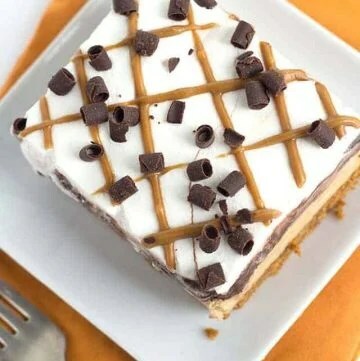 I’ve made a similar recipe but it’s a chocolate peanut butter layer dessert. It’s pretty popular. I was looking through the pinterest comments on that recipe and someone had said that they would replace the pudding with ganache. That’s totally possible! I used pudding in this recipe, but grab the ganache recipe from my mocha layer cake with coffee frosting recipe and use that. It will be the perfect consistency after being refrigerated. I have some ganache recipes that aren’t great to be sitting in the fridge for long periods. It becomes too hard and we want to keep this dessert soft, creamy, and fluffy. Another thing I think I should say about this recipe is that this isn’t a recipe that you can make several days ahead of time. If you can’t make the day you’re planning on serving it, you can get away with it being made the night before. Anything longer than that, you’re taking a BIG risk of the whipped cream starting to separate and the brown from the chocolate pudding may start seeping through the whipped cream. 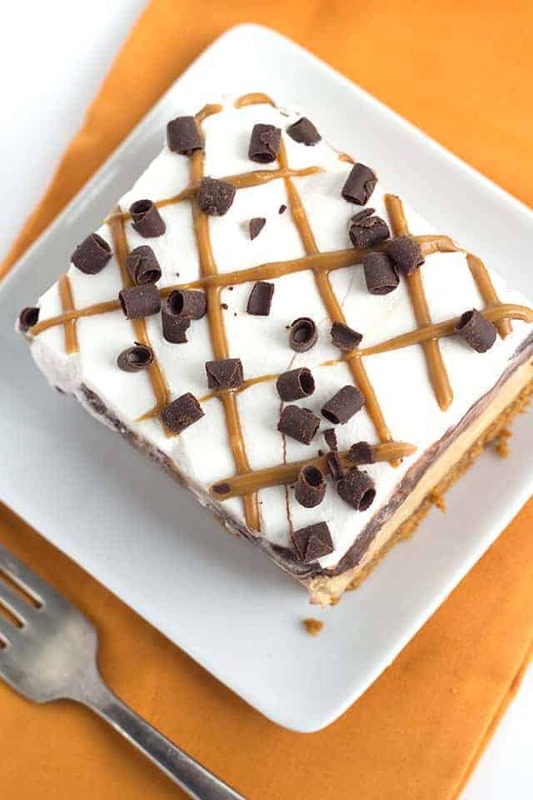 If you’re not sure about cookie butter, you can also try this as a chocolate peanut butter layer dessert! You don’t need a Trader Joe’s near you for that one and it’s super popular. 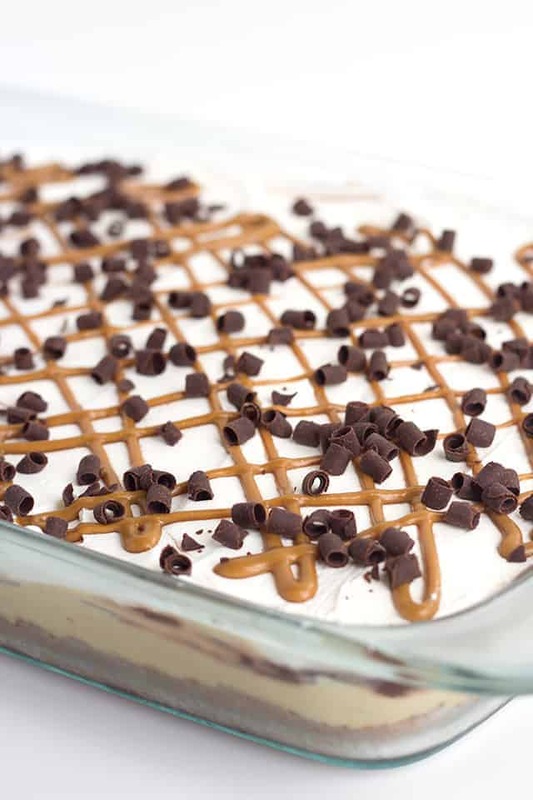 This cookie butter layer dessert will become a new favorite! It starts with a speculoos cookie layer and it only gets better! Following the crust is a cookie butter cheesecake filling that's creamy and highly addictive! Add the speculoos cookies into a bag and crush with a rolling pin until the cookies are all crumbs. You could also use the food processor to make it quicker. In a 9x13 pan, add in the speculoos cookie crumbs, granulated sugars, and melted butter. Stir to coat all the cookie crumbs in the melted butter. Firmly press the crumbs into the pan. In a medium bowl, add in the cream cheese, cookie butter and butter. Beat on medium/high until light and fluffy. In a separate bowl. add in the heavy cream. Beat on medium/high with a handmixer until stiff peaks form. When you pull the beaters out of the whipped cream, it should be able to hold a peak. Spread the filling into the cooled crust. Be sure to get to all of the edges of the crust. Seal off any holes on the edges to prevent the pudding (in the next step) from seeping through and making our crust soggy. In a mixing bowl, add in the chocolate pudding mix and milk. Using a handmixer, beat on medium until incorporated. Let thicken about 5 minutes before spreading on top of the cheesecake layer. 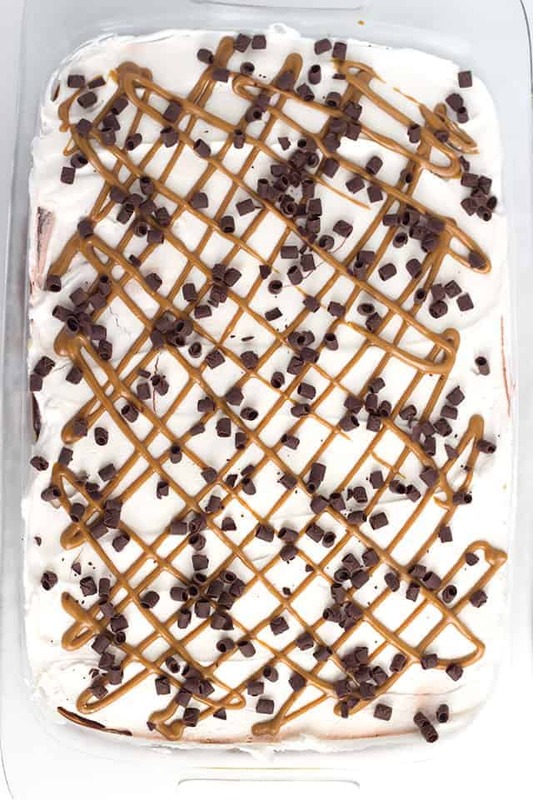 Spread the pudding evenly over top of the cookie butter cream cheese layer. Be sure to get to the edges. Add the 1 1/2 tablespoons of cookie butter into a sandwich bag. Place into the microwave for about 20 seconds. Squish it around in your hand to make sure it's all runny. 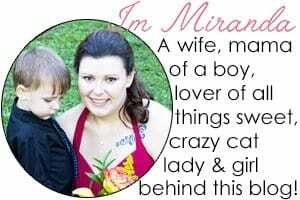 Add on the chocolate curls. You can buy the chocolate curls online or make them by using a sharp vegetable peeler and shaving off the sides of a chocolate bar. Mouth watering stuff, this looks super delicious!